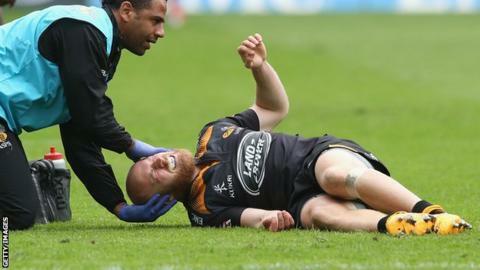 Wasps scrum-half Joe Simpson will miss this Saturday's Premiership season finale after straining a ligament in his left knee against Leicester Tigers. The 26-year-old does not require surgery, but he will be unable to play for between six and eight weeks. Simpson, who won an England cap against Georgia in 2011, has played 28 games this season, scoring seven tries. Sixth-placed Wasps need at least a point from their trip to London Irish to earn a Champions Cup place. Simpson was injured in a heavy challenge from Leicester's Niki Goneva early in the second half of last Saturday's game, which Wasps lost 26-21. "Whether it was late or not, I don't know. But it wasn't given, so I guess not," Wasps director of rugby Dai Young told BBC Sport after the game. "Losing any of your quality players is always a bit of a blow."